Practical and super cute – this awesome kitchen scale will definitely fit in every kitchen! Designer is Radomir Shterev and the name of this cool kitchen gadget is simply the Ball. It is not hard to conclude why is it called that way – because of its playful look that resembles the ball. 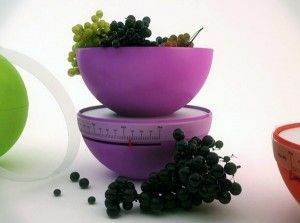 The design is really simple and minimalistic – it comes in two halves so top part can serve as a bowl for ingredients you have to measure and lower part of the ball is a weighing scale. So, you only have to remove the top lid to use it as the standard scale that is located in the lower hemisphere of the ball. After you used it, just cover it with the other half of the ball and it will become perfect kitchen accessory. You can choose from all kind of colours like purple, red, yellow or green, so whatever you choose it will definitely bring some life to every kitchen workspace.